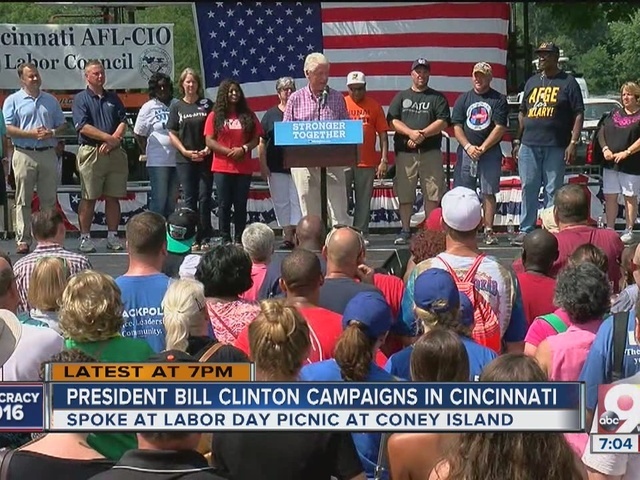 CINCINNATI -- As he stood on stage at Coney Island, Bill Clinton remembered his visit here 24 years ago. Democrats hope the former president hasn't lost his luster since then, as he worked to convince blue-collar voters to throw their support behind his wife and Democratic presidential nominee, Hillary Clinton. Monday's speech at the annual AFL-CIO Labor Day Picnic was tailor-made for the union crowd. "We’ve got to grow together," he said. "We got to be stronger together. "We can’t afford to be divided by race and religion and sexual orientation and all this other stuff that has been thrown out like hot boiling water on." IN DEPTH: Does Clinton have union vote locked up? Clinton also touched on voting rights, immigration reform and recent controversies around the Clinton Foundation, saying his wife's political opponents are targeting the nonprofit to distract voters from the issues. Based on the records released so far, the Associated Press found that more than half the people outside the government who met or spoke by telephone with Hillary Clinton during her tenure as a Cabinet secretary had given money -- either personally or through companies or groups -- to the Clinton Foundation. The AP's analysis focused on people with private interests and excluded her meetings or calls with U.S. federal employees or foreign government representatives. Clinton gave examples of Clinton Foundation partner projects, including with Cincinnati-based consumer products company Procter & Gamble Co. He said P&G's clean water initiative has provided billions of water-purifying packets to help give safe drinking water in poor countries. He asked: "Is there something wrong with that?" 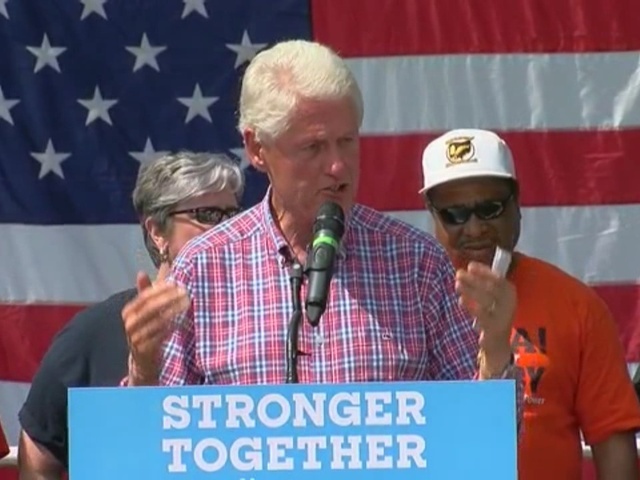 Clinton also thanked Ohio voters for supporting him and his wife over the years. "I've always felt close to Ohio," he said. "I've always been grateful. I was grateful in '92, I was grateful in '96, and I was grateful when you voted for Hillary in the primary -- it meant more to me than you'll ever know." A notable absence from Bill Clinton's 30-minute speech: He never mentioned his wife's opponent, Republican Donald Trump. "I really liked just the 'stronger together' -- him trying to bring the union together versus apart," said Jennifer Mayhall, who'd waited in near-90-degree heat to hear Clinton speak. Afterward, the former president made a trip to Cincinnati's Over-the-Rhine neighborhood for some Graeter's ice cream. His order: raspberry and lemon sorbet.